Woods Hole Oceanographic Institution scientist Mark Baumgartner says that to help the whales survive much longer, the ropes Maine lobstermen use to tend their traps have to be modified or even eliminated. And it's not just for the whales' sake. 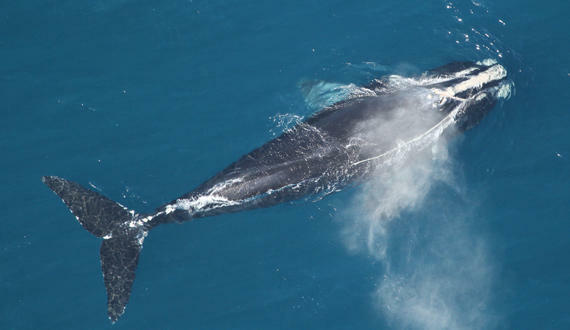 In four separate summers, the latest in 2000, scientist Mark Baumgartner and colleagues tagged 18 North Atlantic right whales and used satellite telemetry to chart their movements. What they found surprised them: the whales ranged far more widely around the Gulf of Maine than they had expected. "I feel the industry is in jeopardy,” Baumgartner says. Baumgartner was at the Fishermen's Forum in Rockland late last week to detail the whale's plight. If the lobster industry doesn't respond effectively, he says, the federal government will step in. "As the population continues to decline and pressure is put on the government to do something about it, then they're going to turn to closures, because that's all they'll have," he says. There were about 450 North Atlantic right whales estimated to be alive in 2016. There were only five calves born last year, and a record 17 deaths caused by entanglement or ship strikes. Baumgartner says with another death and no new births this year the trend-line is tipping toward effective extinction within 20 years. He is getting a somewhat frosty reception from Maine lobstermen for delivering this news. "There was a lot of deaths on the right whales this year, but none in the Gulf of Maine," says Bob Williams, who has been hauling traps off Stonington for more than six decades. While none of the dead were found near the Maine's coast, three were in fact found in southern New England in the Gulf of Maine, which stretches from Cape Cod to Nova Scotia. Williams says in the last ten years lobstermen have already made expensive adjustments in response to federal regulation: buying ground lines that sink to the bottom instead of floating free, and stringing more traps to a single buoy line. He thinks the latest solutions proposed by the scientists, weaker ropes or even rope-less technology that relies on radio signals to locate traps , are likely unworkable off Maine. "Because we have heavy tides and all that and the farther east you go down towards eastern Maine, the extreme tides down there," he says. "Canada needs to step up," says Patrick Kelliher, the Commissioner of Maine's Department of Marine Resources. Kelliher He says that while the Gulf of Maine is a known part of the whales' territory, it's mostly far out from Maine's coast, and few lobstermen have ever see one. Meanwhile, he says, Canada's Gulf of St. Lawrence has suddenly become a killing ground. "With what's going on in the Gulf of St. Lawrence right now with the Canadian crab fishery, that's where most of that gear is,” he says. “If you looked at the diameter of that rope, that's not Maine fishing gear, could be offshore lobster gear but a lot of it is known to be Canadian." In an unusual new circumstance, most of the whale deaths last year were were found in Canada's Gulf of St. Lawrence, rather then U.S. waters. Scientists conjecture that the whales are ranging more widely, following the ebb and flow of their primary food source, and may be looking for new ones. Their staple is a tiny crustacean called Calanus finmarchicus, whose abundance may be subject to changing currents and to climate change. "The reason whales died last year is because they were utilizing relatively new habitats, where there's not protective legislation in place," says Erin Meyer-Gutbrod, a marine scientist at the University of California Santa Barbara. "So when the whales go up to the Gulf of St. Lawrence where we don't expect to see them, then they're facing waters that aren't protected by vessel speed reductions, fishing gear regulations, seasonal fishery closures, they don't have any of those protections because we didn't realize they were going to be there." The Canadian government is moving toward new regulation. Earlier this year it imposed requirements that would be familiar to U.S. lobstermen, like strictures on floating rope, marking rope so it can be identified if found on a whale, mandatory reporting of lost gear. Last week Canada Department of Fisheries and Oceans biologist Matthew Harding floated a new idea to fishermen in New Brunswick's growing snow crab industry. He told a CBC reporter that the government could shut down a large swathe of the fishery during a period when whales might be present, or it could take more dynamic action. “Which would be smaller temporary closures that could be could be more mobile and more tailored and specific to certain areas," he says. More dynamic, short-term closures for quick response to changing whale habits are being considered in the U.S. too. Some Maine scientists are working on the idea, but say they need more time and funding before their models could be accurate and nimble enough to help. There may not be much time. Last month the Conservation Law Foundation's Portland office filed a federal lawsuit against the National Oceanic and Atmospheric Administration for violating the Endangered Species Act. CLF says NOAA is failing to regulate Maine's lobster fishery in a way that protects the whale from extinction. "The majesty of this incredible species that they've been able to treasure,” says CLF Lawyer Emily Green. “They would experience it as a personal loss, if they knew that was something they could never experience again because in their lifetime their own government had failed to protect the preservation of the species." Stakeholders in both countries are working to devise new ways to preserve the whales, as well as lobster and crab fisheries. The U.S government says it's already launched an assessment that could be the basis for new rules that will take at least a half a year to complete. CLF's suit, and another from other environmental groups, say the government should be forced to complete the assessment within two months.